The respiratory diaphragm is a musculotendinous dome-shaped shelf that divides the thoracic cavity from the abdominal cavity. It is one of the four named diaphragms in human anatomy. This is why it is proper to call it the "respiratory diaphragm" instead of just "diaphragm". The name comes from the Greek, where the prefix [dia-] means "complete" or "through" and [phragm] means "a partition". In Latin, Celsus called it the "septum transversum", meaning "the transverse partition". 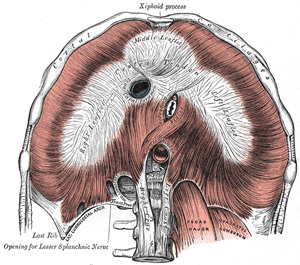 The root term for [diaphragm] is [-phren-], as in phrenic nerves and cardiacophrenic vessels. The respiratory diaphragm has a club-shaped central tendon (as in a card suit) which has a large hiatus for the inferior vena cava. The muscular portion is formed by skeletal (voluntary) muscle and descends skirt-like to attach to the internal aspect of the sternum and ribs anterolaterally, and a complex system of lumbocostal tendinous arches posteriorly. It receives its blood supply through branches of the intercostal arteries, the musculophrenic artery, and the pericardiacophrenic arteries. It is innervated by the phrenic nerves, which descend through the mediastinum in relation to the pericardium. • Hiatuses (2) for the superior epigastric vessels, which are the inferior continuation of the internal thoracic (mammary) vessels. Also known as the hiatuses of Morgagni. The most common site for an internal abdominothoracic herniation is the esophageal hiatus, but there are other respiratory diaphragm hernias, including the retrosternal hernia of Morgagni (through the superior epigastric hiatus), and the hernia of Bochdalek (a congenital hernia through an incomplete central tendon of the respiratory diaphragm).